"On June 15th 1989 the Swiss company “CIBA-GEIGY” (Basel) got an European patent (No.0351357): without genetic modifications, just with electrostatic fields they can create fossil forms of fish, fern, mushroom …today nobody remembers these experiments anymore…"
I don't have anymore on this, the internet is clean on this one. Seems like a good winter experiment.. Many thanks for this post. This could be the next big thing for survival if things got really bad. I think some should try and do their own experiments to see the variables. If all this is true, then obviously it has been suppressed. Worthy of a Nobel prize IMO. 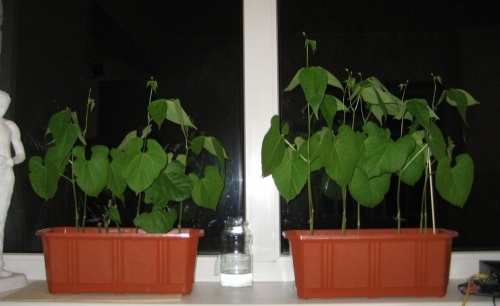 Even though I am getting old, I will try and find a grower and try and set up some simple experiments in the coming months. Great find and thanks for posting! The book "The Primeval Code" by Luc Bürgin is only available in German. Have contacted Luc to see when available in English. so how do we create the electrostatic field on this? It just shows two pieces of aluminum, do we electrify both pieces with a seed in the middle? Are both pieces of aluminum electrified from the same source? Sorry, I am not very literate in electricity. Thank you Dave, this is wonderful information. Tesla's high voltage ozone maker might be easily adapted. The basic induction coil wow. I couldn't stand the noise but it could work. And, the joule thief can get to 300v and with a boost can go to over 1,000v. It makes me wonder if this is the reason the room feels so good when there is a joule thief circuit being used for the lighting. It might be an easy thing to try. The plants in the plant battery which are running joule thief circuits and therefore surrounded by high frequency high voltage spikes with no current certainly are thriving. (and they are not very high voltage, either...just spikes. But, yes, keep away from animals. Stick with food plants. There is a very easy to make electrostatic generator described by Morris(?) from Tufts in his book called "Ben Franklin My lab Partner" It uses a piece of fake fur and aluminum foil and a turning wheel. A cheapo van de graff generator, or wimhurst maachine. This is certainly an interesting direction for more research. I think it should be rectified. Maybe with 32 x 1N4007 in series. I found my circuit produce mostly DC. I think any circuit must be tested with neon bulb to see if the output is AC or DC. I think joule thief HV coil output is AC. The leg that coiling the other is negative dominant. Don't install the car coil backward. If you use transformer, use neon bulb or candle light. The negative part will lit the electrode and blow wind to candle fire. And, the joule thief can get to 300v and with a boost can go to over 1,000v. It makes me wonder if this is the reason the room feels so good when there is a joule thief circuit being used for the lighting. That is new. Most people here said to feel sick around them. I guess I am not alone with radiant circuit that can produce good vibe . Last edited by sucahyo; 06-24-2010 at 03:28 AM. The difference is that detail of where you call the center line. The MK1 has so many spikes going both ways that the scope will show it as ac and a cap will make a sine wave. which results in useful and desirable qualities of fish. direct voltage can vary from 1 to a couple of 10000 volts. size of the aquarium, but preferable it should be between 1-10cm. Since they make the point that there is NO current, I think it does not matter whether the source is AC or pulsed DC. It is high voltage no current that is what works here. The infinitely high, infinitely narrow spikes are what I believe make the magic. Really from a joule thief? I miss it when there is not one going in a room! Last edited by jeanna; 06-24-2010 at 07:35 PM. I want to always turn on my charger too . Thanks. But AC will do things differently from DC. Puharich water electrolysis for instance, it start as a reasearch for human body. He use AC. The voltage between atmosphere and earth is high voltage DC with no current. According to schauberger, healthy tree has voltage, which is DC. Healthy river has voltage, which is DC. I think for growth, DC is more preferable. I think we should use DC. Although AC may also be needed for improving the quality of water of plant life. But I still think it would produce different effect. Last edited by sucahyo; 06-25-2010 at 02:31 AM. Please explain why you are saying this. I am not talking about AC as in 50 or 60 Hz regular sine wave. I doubt that is good for anybody or anything. I am just saying that depending on where you are standing the pulsed DC can look like pulsed AC. I would like to know what the difference is. Tesla made a high voltage ozone maker, and it is this I am thinking could make these pulses. I guess what I have been thinking is that we will be crossing the plane of the galaxy where the very strong EMF pulse(s) will be coming our way. maybe it will change the genome of plants and animals. I am wondering if we will need to improve our life skills. I wonder if we will be "seeing" a saber tooth tiger after the crossing?--- Did I really want to say that? This experiment has been nagging at my mind since I encountered it. Those of you using coils need make a doubler or tripler circuit to convert to DC, and then a HV cap to smooth it out clean. Old TV sets had separate triplers creating the hvdc for the CRT. The crt was the cap that smoothed the dc. Using a tripler will also allow you to use less power on the coil. Dont forget to build in an adjustment for the output HV. A rheostat in series with the the oscillators fet to the coil.. Real hi voltage may not be necessary if the dimensions are small?? Maybe use a variac, 220ac and a doubler or tripler and the smoothing cap. Or a commercial adjustable HVDC power supply can utilized. a. be insulated from contacting the plates. b. be oriented vertical with the top plate +. like natural e-field. Are the seeds germinating in the artificial field or just stored dormant there for a period of time and then germinated??? As for fish eggs are they subjected to the field before fertilization, during, after??? Does phase of the moon affect the effect? Ill be looking for some real thin glass to make the tiny flat aquarium for the egg and seed experiments. Viewing this vid YouTube - MIT Physics Demo -- Dissectible Capacitor Should the seeds and eggs be discharged??? Last edited by dave_cahoon; 06-27-2010 at 05:09 PM. a wave that going negative and positive (AC) usually used for destroying things, dissociate things. A voltage potential usually associated with acceleration or growth. A sine wave usually associated with resonance that can be an AC or DC. Puharich use DC sinewave at 1/3Hz current control and AM modulated 20Hz AC sinewave of 600Hz AC sinewave. I think you refer to DC sinewave? Ac Ionization. In alternating-current technology, high voltage is applied to a number of closely spaced emitter points that cycle negative and positive at the line frequency of 50 or 60 Hz. Ionization efficiency is low because the points remain above the ionization threshold voltage for each polarity only a small percentage of the time. Steady-State Dc Ionization. High voltage of both polarities is continuously applied to pairs of positive and negative emitter points in standard direct-current technology; thus, the efficiency of ion production is better than that of ac ionizers. Pulsed Dc Ionization. Positive and negative high-voltage currents to the emitter points are alternately turned on and off in pulsed systems, creating clouds of positive and negative ions that mix together in the work area. The result is a dramatic lowering of the recombination rate. Those of you using coils need make a doubler or tripler circuit to convert to DC, and then a HV cap to smooth it out clean. I wonder if static HV DC is much better than pulsed HV DC. According to TT Brown, constant acceleration effect can be attained with pulsed high voltage DC. A static DC will produce only damped acceleration. I think the only reason I notice vigorous ion wind blowing fire in my candle experiment only happen because my circuit can produce pulsed HV DC. If the effect is to replicate the earth gravity, then I opt for pulsed DC because now I think earth electricity is constantly produced (generated pulsed voltage), not accumulated (as in capacitor). I contacted the book company Urzeit code and they said that only German was available. If they would sell it as a .PDF file it could be translated fairly easily with Google language tools or other translation programs. 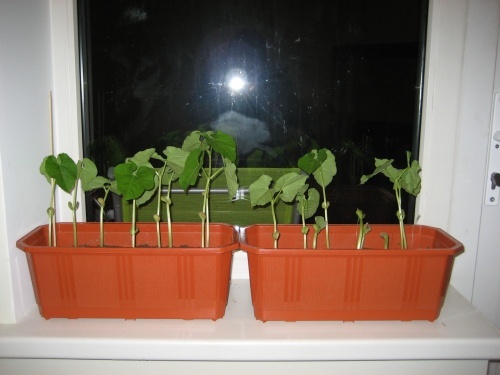 Seeds flown into outer space produce large disease resistant plants. It is probably the higher radiation causing the effect than the lack of gravity. This is shown by the subject of this thread. In regards to the source of high voltage for the experiments on seeds. I would try to avoid high power circuits like fly-back transformers, etc. Getting shocked by these is hazardous to your health. If you use a joule thief, try and use as small a filter capacitor as possible, to reduce the power of an accidental shock. It may be useful to set up something like Lord Kelvin's water drop experiment to generate high voltage to charge the plates? I recall seeing somewhere an even simpler science fair project that just uses a drop of water sliding down a wire to generate enough voltage to flash a neon bulb. Probably, the longer the wire, the higher the voltage? This would be something more like a static charge which connects to the plates above and below the seeds for treatment. All we need here are positive and negative plates to ionize the field where the seeds are placed. A slow drip out of a bucket would probably last all day? It would be more like plumbing than electric circuits? The Duluc Dry-Pile (also called the Zamboni Pile) was an "electrostatic battery" permanent power supply used in the early 1800s and constructed from silver foil, zinc foil, and paper. Foil disks of 2cm dia. were stacked up several thousand thick and then either compressed in a glass tube with endcaps and a screw assembly, or stacked between three glass rods with wooden endplates. Of course this is simply a Voltaic Pile, a multi-cell electrochemical battery, albiet one with output potential in the range of kilovolts. Each cell used nearly-dry paper as electrolyte, with zinc foil for one electrode and silver foil as the other." This was used a source of power for "Perpetual Motion Machine" also described on above link. If power source is a problem, I think any radiant circuit can be made as source. We can run it at low power and the output will automatically raise to HV after a while. They responded saying that they do not have it in PDF format, so I will have to buy the book and then get it translated. Fortunately I know where to get that done, but this may take a few months to get the book and then get a translation. Can someone please translate a little section of this video starting at 8:00 minutes (German to English). Looks like they are at a Ciba-geigy lab explaining the electrostatic seed process? The guy in the video is the son of the man who discovered this effect. He says that you need a high voltage DC field in which those plants, seeds or any other life forms are put in. You need the negative electrode on the top and the positive on the bottom. This kinda simulates environment of a lightning storm. 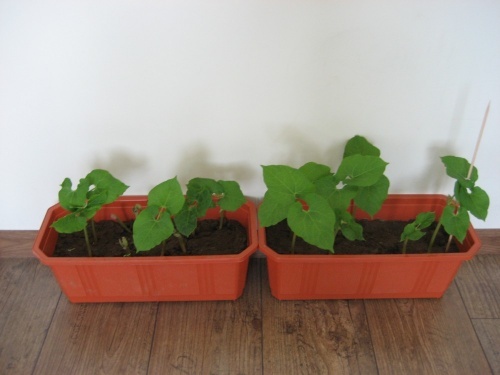 The seeds are put in this electric field for three days and then are grown usually just as any other seeds but they come with benefits, they grow bigger, stronger and more resistant to pests. The inventor stopped his work and never brought it to the market because he worked in a company that produced chemical pesticides and other stuff and this would mean less profit for the company, he was also in bad health at that time. His son now holds the patent rights and is trying to get this thing rolling again with the help of some investors. The effect is very similar to the effect of an orgonite device and why shouldn't it? Orgonite is basically a capacitor. Thank you for taking the time to translate the important info. By the way, great job on the straw bale dome! Have you done anything with Compressed Earth Block? Multimillion dollar homes are constructed using this technology. The effect is very similar to the effect of an orgonite device and why shouldn't it? Orgonite is basically a capacitor. I prefer the other way around. Electric potential produce orgone like an orgonite. You need the negative electrode on the top and the positive on the bottom. Might this approach have simply repaired their mutated DNA? Here is a simple way of generating the field, remember to add a real HV-cap to smooth out the dc. The isolation transformer can be a variac for adjusting the output. Thats my plan for the winter. The earth has an E-field we all developed within. Maybe there is a correlation with cold periods in history. Using core samples how can surface to ionosphere electric potential be measured over time?.. Still, genetic changes can continue even with the rejuvenation periods. I don't now how to continue this hypothesis its all based on an electric differential that's related fundamentally to action of life and the sun.. Both samples grow side by side and get equal amounts of sun light and water. The ones on the right are treated with HV, the left ones are untreated. 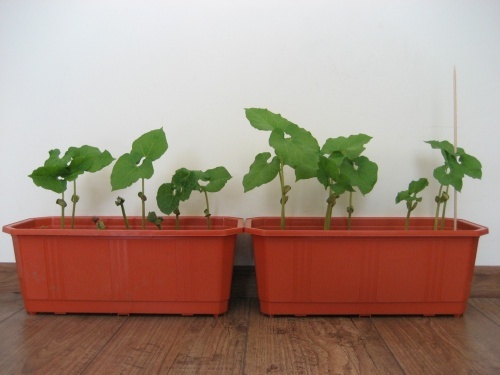 The treated ones have bigger leafs than the control ones and they are also taller. Will see what the next few days will bring.